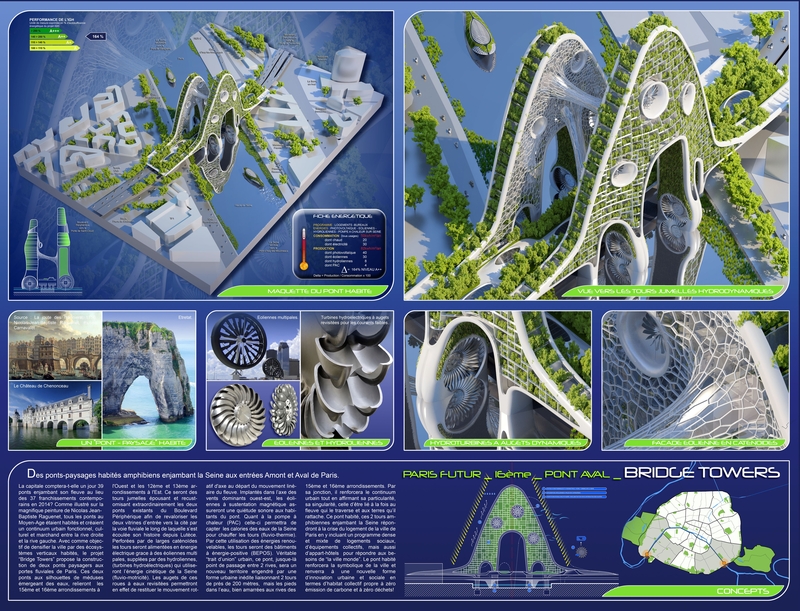 Belgian born, Paris-based 38-year-young archibiotectVincent Callebaut is referred by Time Magazine as the “Best Eco-Utopian Architect” for his fantastic creative imagination to address the world’s environmental and social ills through his futuristic project designs. In the last 15 years, he has won many prestigious awards all over the world with his indomitable nature inspired futuristic designs. 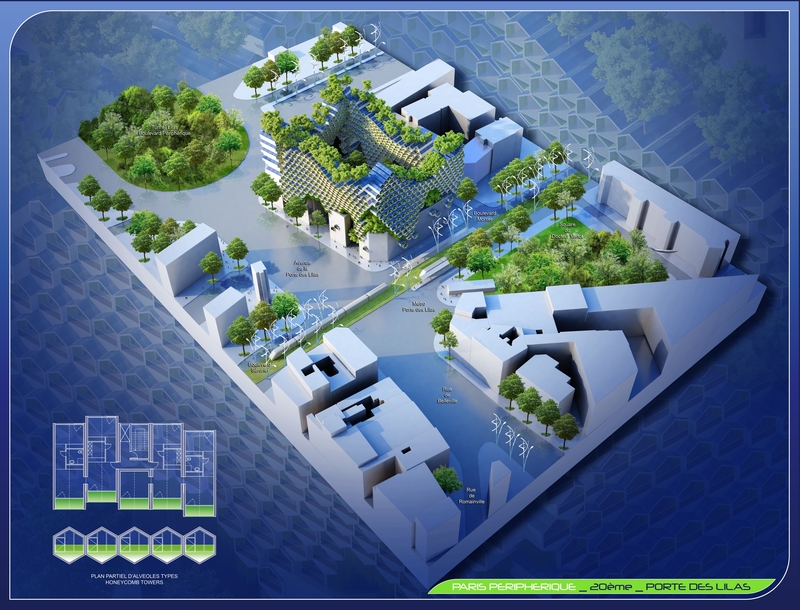 His projects are spread all across the world and he constantly militates for the sustainable development of a new Ecopolises via trans-disciplinary strategies for an investigation architecture mixing biology to information and communication technologies. 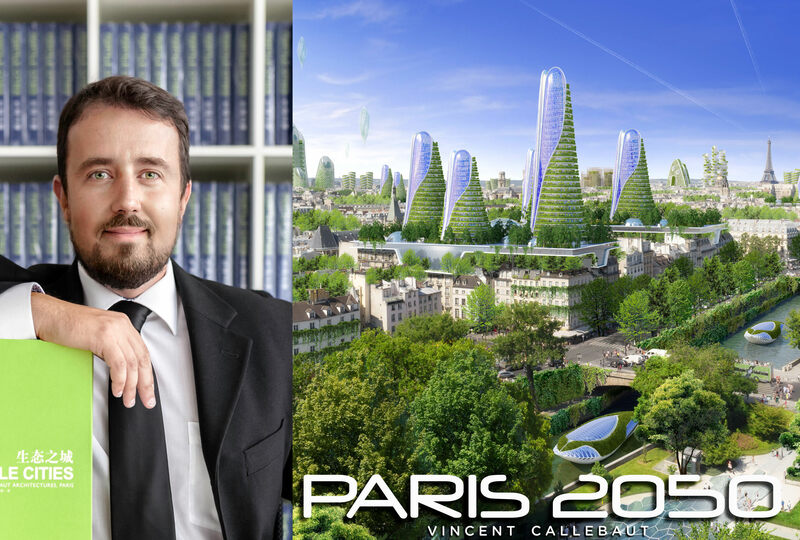 Taking the leadership role in Green Design, Vincent Callebaut has been selected in the “TOP 10 List of HOT TRENDS” in Greenroof and Green wall Design in Georgia in 2014. He has to his credit for having being selected in the “TOP 50 Sustainable Architecture Award Members” of the Green Planet Architects in 2013. The (HBM) cheap housing corresponded until 1949 to the actual HLM (Housing at Moderate Rent). They are mostly implanted in the non-aedificandi (building) area of the old buildings in Paris. This HBM ring is in the heart of the energy renovation of the old buildings in Paris. 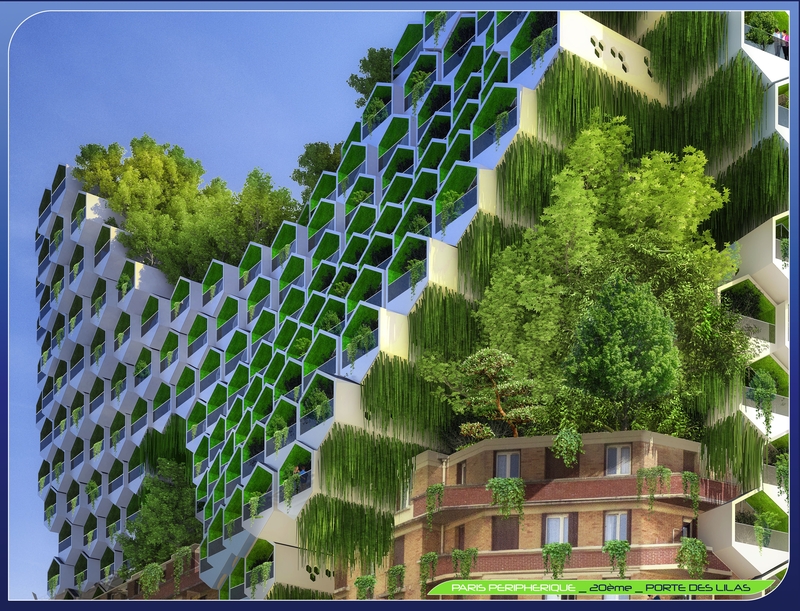 To increase the offer of housings in Paris, the “Honeycomb Towers” propose to double the height of these HBMs by an architecture leading to the construction of individual mini-houses by interlocking the ones to the others. 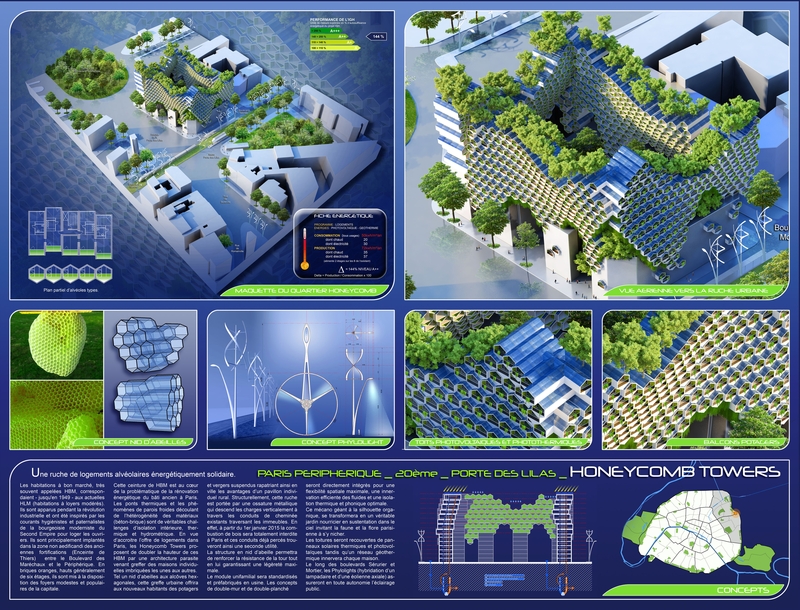 The urban implant such as a honeycomb with hexagonal alcoves will offer the new inhabitants vegetable gardens and suspended orchards repatriating in the city the advantages of a rural individual house. A steel structure descends the loads vertically through the existing chimney ducts crossing the building supporting the hive. The honeycomb structure will enable to reinforce the resistance of the tower by assuring maximum lighting. For a maximal spatial flexibility, the concepts of double-wall and double deck will be directly integrated for an efficient innervation of the fluids and an optimal thermal and sound insulation. 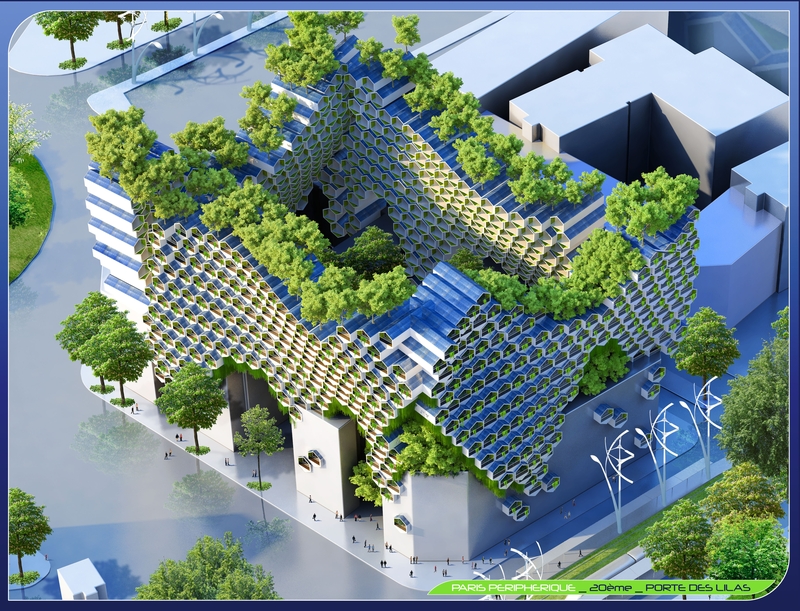 A true suspended nourishing garden in the sky inviting the Parisian fauna and the flora to thrive, will be transformed from the great meccano toy with an organic silhouette. The Phylolights (hybridization of a lamp and an axial turbine) will assure the public lighting self-sufficiently by the thermal and photovoltaic solar panels on the roofs on the Sérurierand Mortier boulevards. Located at the junction of the two districts of Paris – Porte d’Aubervilliers, is an important gate of the Parisian North-East. The North area located in Aubervilliers has seen great transformation from 2005 with Icade Headquarters being constructed followed by the Millénaire Shopping Mall in 2011 and by 2016 the Veotia Headquarters will be ready. A view on Aubervilliers city remains truly urban by the pollution caused by the proliferation of vehicles on top of the ring road. 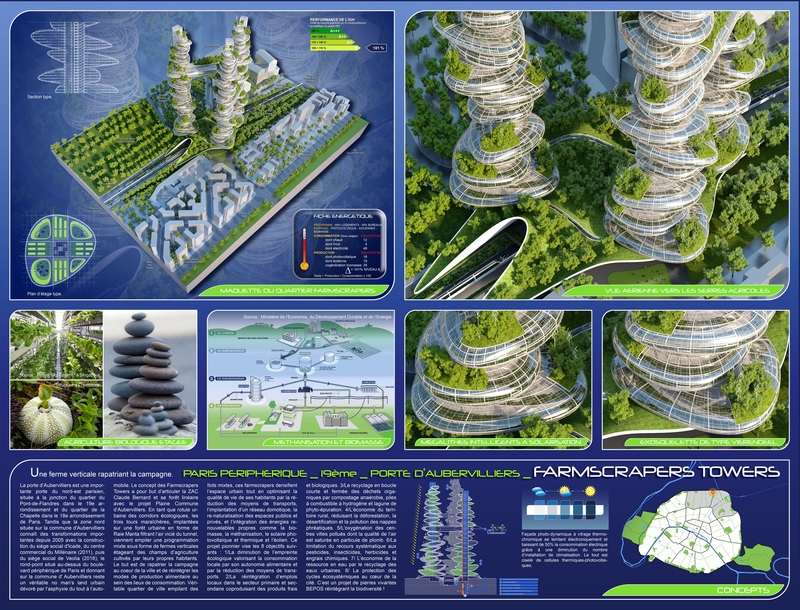 The new master-plan of Aubervilliers aims at articulating the Claude Bernard urban development zone and its linear forest by the “Farmscrapers Towers” concept. Three vegetable towers will be implanted on an urban forest in the shape of a huge manta ray as urban articulation of ecological corridors. The manta ray will filter the air of the tunnel pile up in a mixed programming under the vertical shaped farm with agriculture fields’ floors cultivated by the inhabitants. The main objective being to reintegrate the food production locally to be self-sustained. The reduction of the ecological footprint enhancing the local consumption by its food autonomy and reduction of the transport means. The reintegration of the local employment in the primary and secondary sectors co-producing fresh and organic products. The recycling in short and closed loop of the organic waste by anaerobic compost, hydrogen fuel cells and phyto-purification lagoon. The saving of the rural territory, reducing the deforestation, the desertification and the pollution of the phreatic tables. The oxygenation of the polluted city centres, whose air quality is heavily polluted. The limitation of the systematic recourse to pesticides, insecticides, herbicides and chemical fertilizers. The water saving by recycling the urban waters. 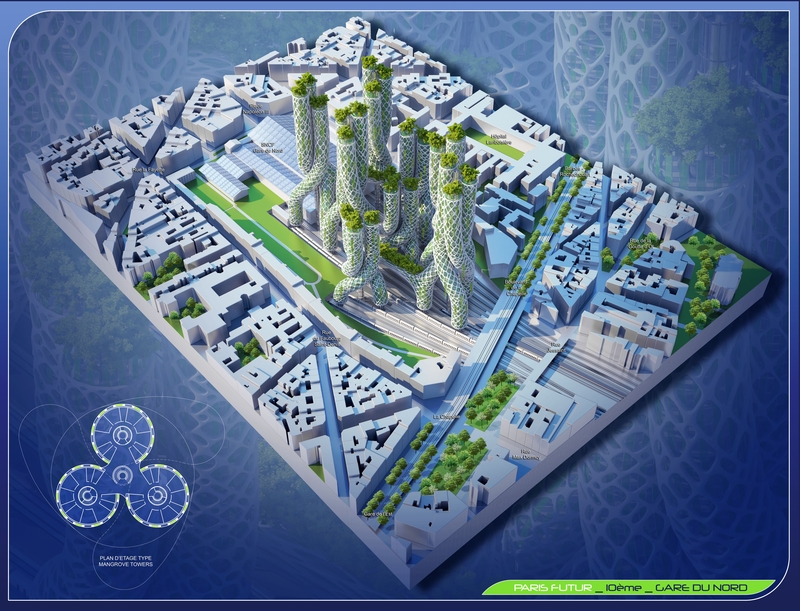 The protection of the eco-systemic cycles in the heart of the city. It’s a project of BEPOS living stones reintegrating the bio-diversity. The “Mangrove Towers” are an inspiration to the mangrove trees of the maritime marshes with their pneumatophores and their still roots. 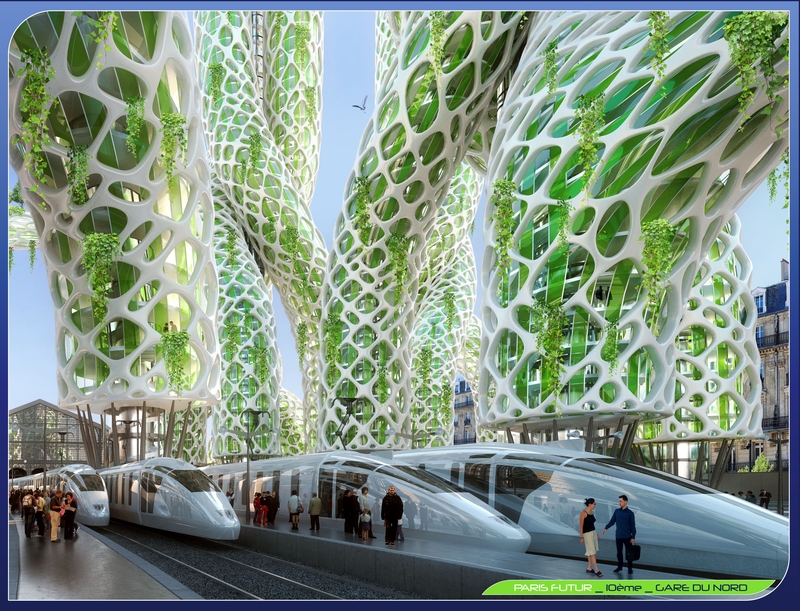 They will be implanted directly of the platforms of the Gare du Nordto ramify with each other as ecosystem resilient to the climate imbalance. A mixed program of offices, hotels and housing dedicated to international and traveling customers will be accommodated in these towers. The urban mangrove will be energy positive, which mean they will consume less (electrical, calorific or food energy) while producing more energy. 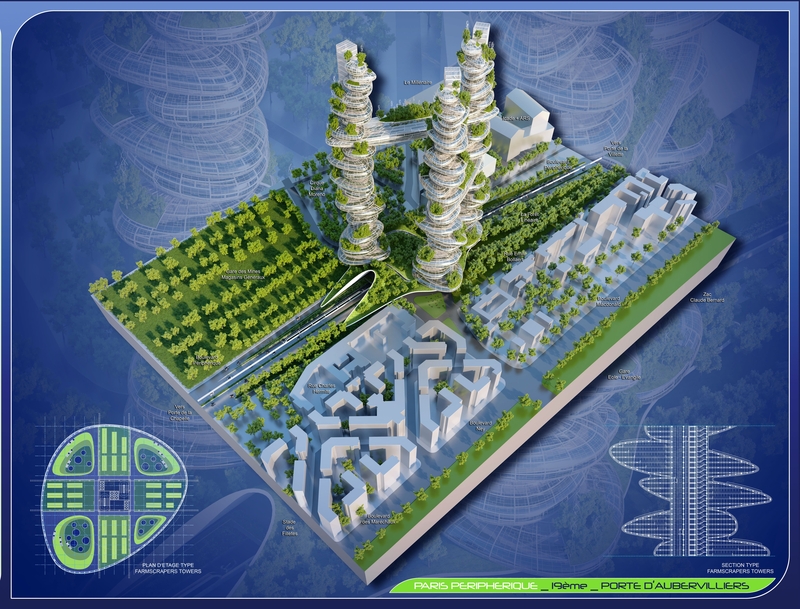 The project will be eco-designed from the state-of-the-art renewable energies to present zero-carbon-footprint. The station platforms will be full of piezoelectrical captors polarizing under the action of the mechanical constraint generated by the travelers. Electricity by electrolysis will be produced by the tubular facades of Grätzel cells forming a photo-electrochemical skin inspired by the light (photons). 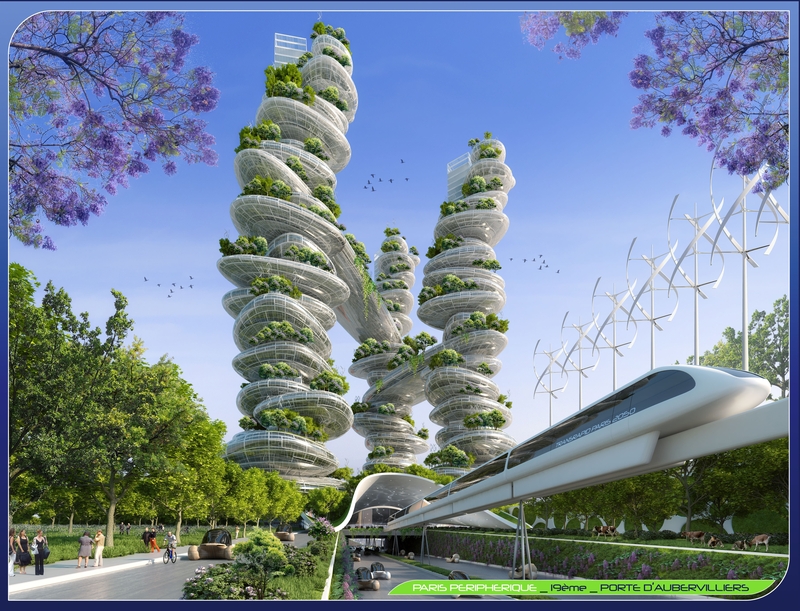 The towers will also be depolluting while making the towers self-sufficient in energy. 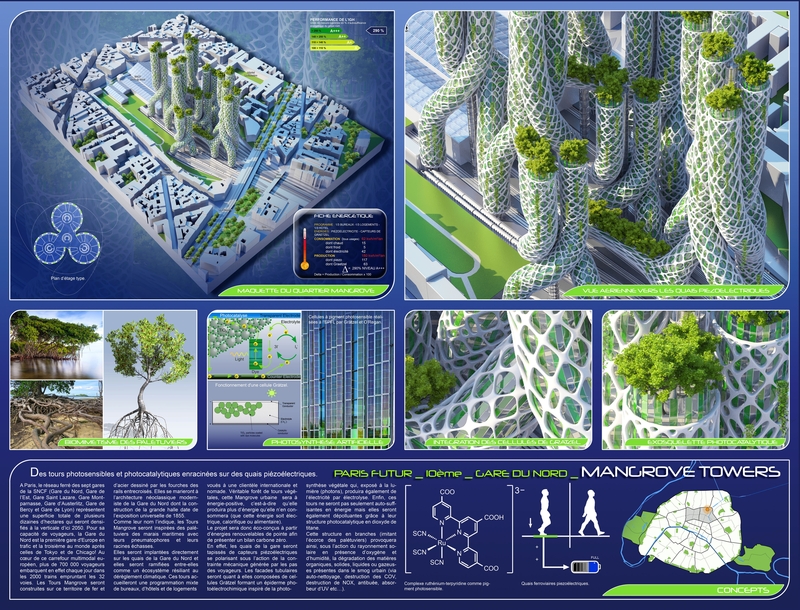 The structure imitating the bark of mangrove trees will cause, under the action of the x-rays, in the presence of oxygen and humidity, the degradation of the organic, solid, liquid and gaseous matters in the urban smog (through self-cleaning, destruction of COV, destruction of NOX, anti-mist, UV absorber, etc.). 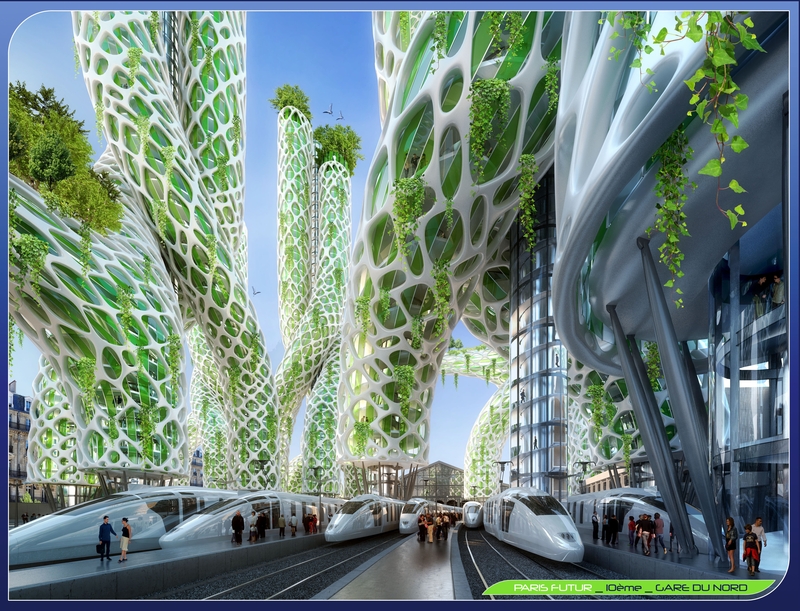 By 2050,the railway network of the seven SNCF train (Gare du Nord, Gare de l’Est, Gare Saint-Lazare, Gare Montparnasse, Gared’Austerlitz, Gare de BercyandGare de Lyon)representing a total surface area of several tens of hectares in Paris will get vertically denser. The “Mangrove Towers” will be built on this territory, of iron and steel drawn by the forks of this intertwined rails. They will join the modernist neoclassical architecture of the Gare du Nord, whose construction of the Great Hall dates from the universal exhibition of 1855. The beautiful painting ofNicolas Jean-Baptiste Raguenetdepicts beautifully all the bridges of the Middle-Ages were inhabited and created a functional, cultural and merchant urban continuum between the right bank and the left bank. 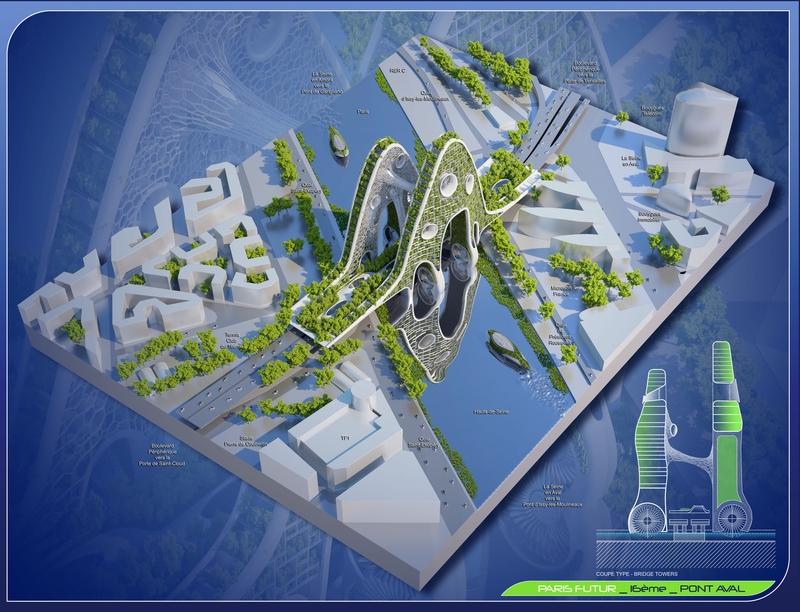 The “Bridge Towers” project proposed the construction of two green bridges at the river gates of Paris with the objective of making the city denser by inhabited vertical ecosystems. The two bridges with jellyfish silhouettes emerging from the water will link the 15th and the 16th arrondissements in the west to the 12th and 13th district in the east. The twin towers molding and re-customizing extraordinarily both existing bridges of the ring road, in order to enhance both entrances to the city by the river along which its history flewfrom Lutece. 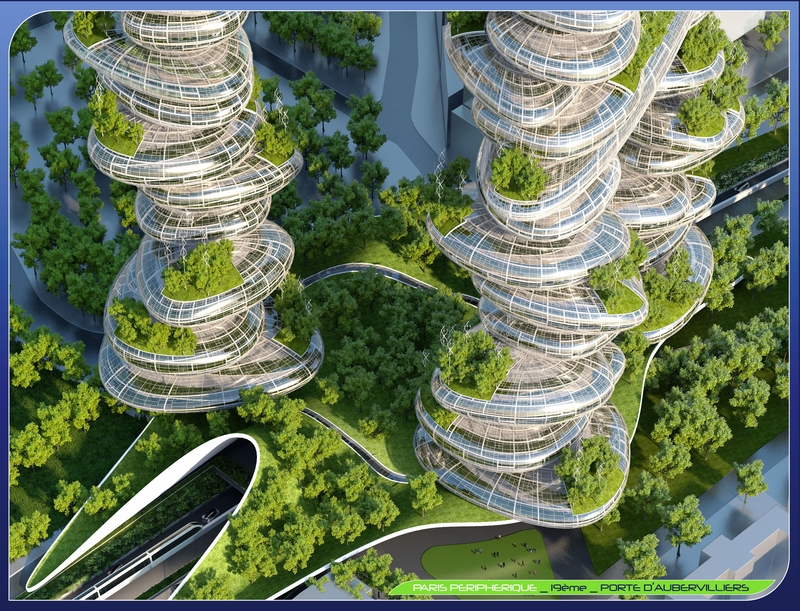 Perforated by wide funnels, the towers will be supplied by electrical energy, thanks to multi blades wind turbines replaced by hydro-kinetic turbines (hydro-electrical turbines), which will use the kinetic energy (river mobility). The conveyors of these water wheels will enable to reestablish the rotary movement of the axis from the linear movement of the river. The heat pump will enable to capture the water calories of the Seine to heat the towers. 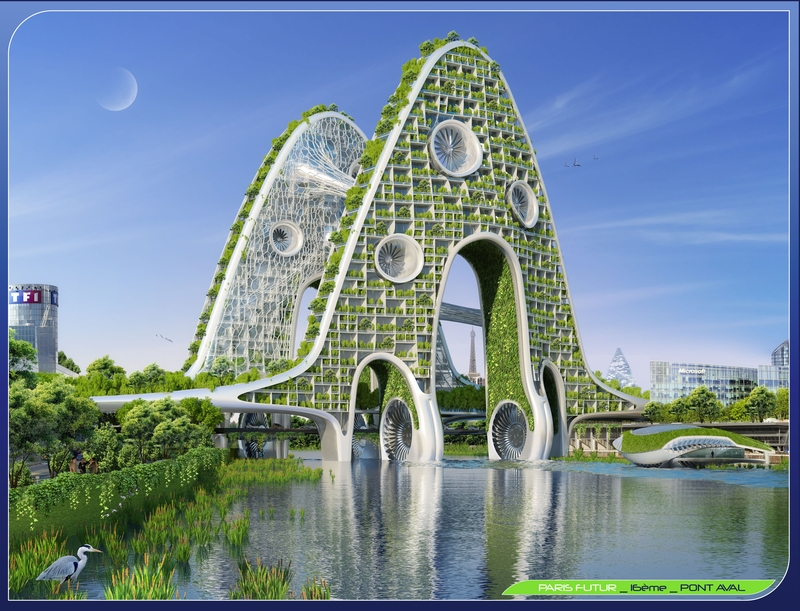 By this use of renewable energies, the towers will be BEPOS building, i.e. with positive energy. The two amphibian towers across the Seine will meet the housing crisis of the city of Paris by including a dense and mixed program facilities, hotel-apartments to meet the needs of the world city. 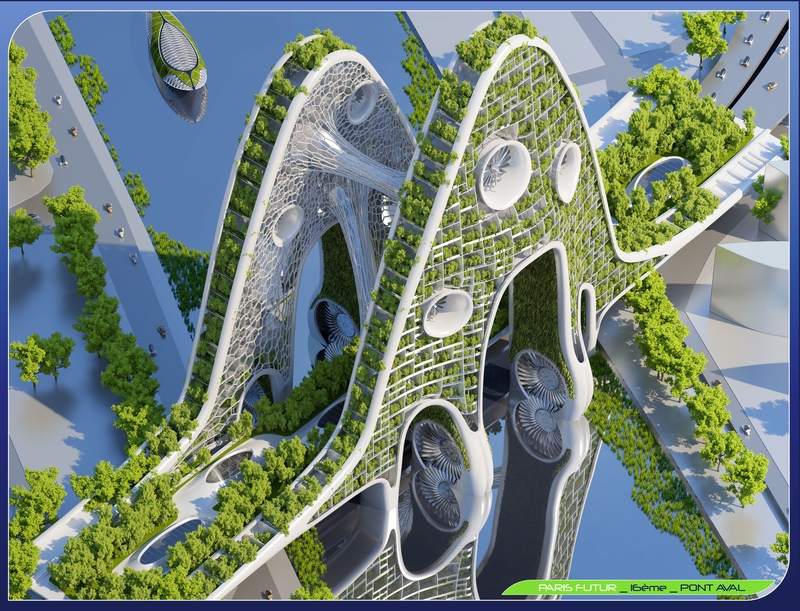 The inhabited bridge will reinforce the symbolism of the city and will refer to a new form of urban and social innovation in terms of clean collective housing with zero carbon emission and zero waste!